Mike Ayers, the former goaltending coach with USA Hockey’s National Team Development Program and a current assistant coach with Boston College, searched for the best way to describe Alex Tuch’s on-ice presence. After a few moments, he found what he was looking for. Ayers was familiar with the right wing’s talents prior to their Boston College days, when the two were part of the U.S. National Development Team that’s based in Michigan. For two seasons, from 2014-16, the strapping forward from Syracuse played an impactful role for the Boston College Eagles, scoring 14 goals in 37 games in his rookie campaign, landing him a spot on the Hockey East All-Rookie Team. In his sophomore season, Tuch recorded 18 tallies and 34 points over 40 games, as part of the Eagles team that made it to the NCAA Frozen Four. Drafted 18th overall by the Minnesota Wild in 2014, the six-foot-four, 222-pound Tuch landed with the Vegas Golden Knights June 21, 2017. In 78 games last season, Tuch scored 15 goals, including his first NHL goal last October against Boston, and produced 37 points. 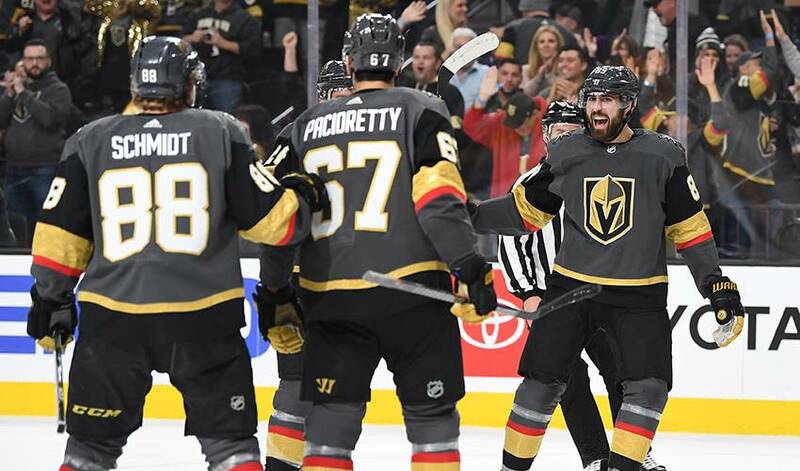 Less than 50 games into 2018-19, he’s already eclipsed those offensive totals, while averaging .85 points per game for the Golden Knights. He's also leading his team with 40 points and 24 assists, and trails just teammate Jonathan Marchessault with 16 goals scored this season. Those numbers include six game-winning goals, two better than his 2017-18 output. Tuch has also seen more ice time this season, averaging two minutes more per game. “As a professional athlete, you have to have self-confidence,” said Ayers. “I think he’s always had that, but for him to use that to propel him to the next level has been exceptional. Brendan Smith had quite a topsy-turvy, but enjoyable spring.